Due to the customizable nature of this product, please allow an additional 3 days for shipping. Thoughtful and personal, the family tree necklace is the perfect gift for any woman in your life—or for you. Beautifully handmade in Maryland, each necklace can be customized to reflect important children’s or grandchildren’s birthdates or other important dates or milestones with bezel-set Swarovski crystal charms. 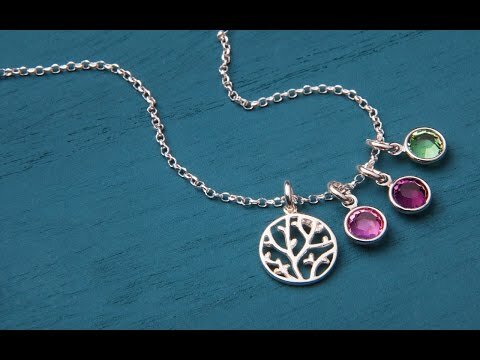 I love my family tree necklace! I LOVE this necklace! Vintage Stamp Jewels was so patient and kind in customizing it perfectly! I would definitely buy from them again! Excellent necklace. Top quality. My wife absolutely loved it.